Beer #1113 is an english strong ale brewed by Moa in Blenheim, New Zealand. An enjoyable hoppy ale, faintly smells of toffee and caramel, some bitterness but not enough for me Still, this New Zealand brewery is pretty good. The bottle size is 375ML with an alcohol content of 6.20% (containing approximately 1.80 AU / 2.30 UK standard drinks), and it cost me $9.00. 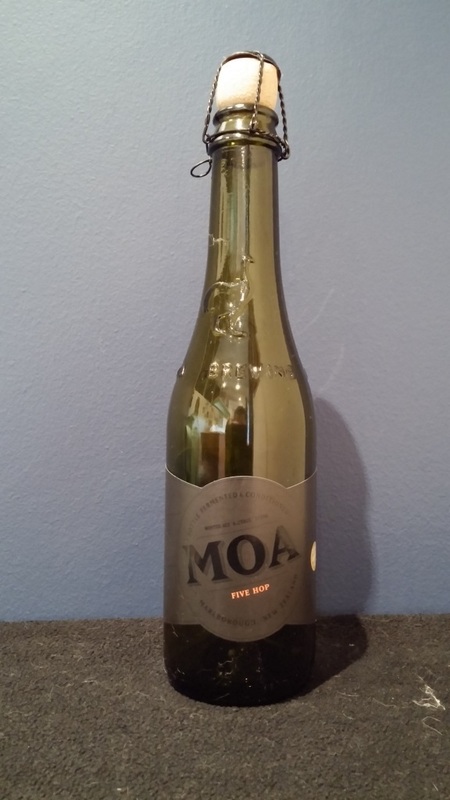 Moa Five Hop is a New Zealand take on a traditional English ale. A range of Nelson Hops including Cascade, Pacifica, Motueka, Hallertau and Sauvin give Moa Five Hop a savoury, hoppy nose and creamy, honeyed characters on the palate. A well-balanced companion to any meal.